While the Nebraska football team doesn't have Jordan Westerkamp or Brandon Reilly anymore, it has plenty of young talent to carry the wide receiver mantle. 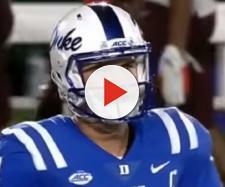 There is, in fact, so much young talent that the group as a whole is getting some big time national recognition before we have any idea what they can do with a new quarterback behind center. ESPN just put out its rating of the best pass catchers in the Big Ten and while the Nebraska football team doesn't rate as the best of the best, the sports giant tells readers they shouldn't sleep on the Huskers. There is still going to be some hurdles if the group wants to be considered among the premiere wide receiver corps in the country but it's a safe bet that the Cornhuskers are getting noticed around the country as a place receivers can go and flourish. Who is considered better than the Nebraska football team? It shouldn't come as a huge surprise that Penn State gets rated as the "best of the best." The Nittany Lions have three seniors returning in DaeSean Hamilton, Saeed Blacknall and Mike Gesicki who are going to carry the load. That load is for a team that came out of nowhere and won the Big Ten title a year ago. While none of the trio had eye-popping numbers all on their own, they could form a kind of three-headed monster that is going to be hard for opposing defenses to keep covered. When talking about a group that is "next in line," ESPN isn't picking either Ohio State or Michigan. Wisconsin isn't on this list either. The surprise of the list, has to be an Indiana crew that also came out of nowhere and played quite a bit better offensively than most people expected. The Hoosiers have a formidable one-two punch in Nick Westbrook and Simmie Cobbs Jr. who are both tall and fast. Indiana benefits a bit from the traditional powers of the conference not having wide receivers that are established as the cream of the crop. Westerkamp and Reilly are indeed gone, but the Huskers might actually have a better one-two punch raw talent wise with De’Mornay Pierson-El and Stanley Morgan Jr. Pierson-El especially is a receiver/returner who is absolutely electric when he is fully healthy. He and Morgan looked really good in the spring and both appear poised to take the next step. Nebraska is hoping one of its many, many young receivers like Keyshawn Johnson Jr. and Jaevon McQuitty will be able to step up early and often. If they can, and if Tanner Lee is as good as advertised, the group could rise to the top of the Big Ten quickly.